ICIMOD has band of very accomplished musicians who play theme songs or regional songs. It is blessed with great capacity in direction. Never before have I felt a greater need for orchestrated music, where bands of musicians, as a team, than at the GB Pant Institute of Himalayan Environment and Development in Almora, India. 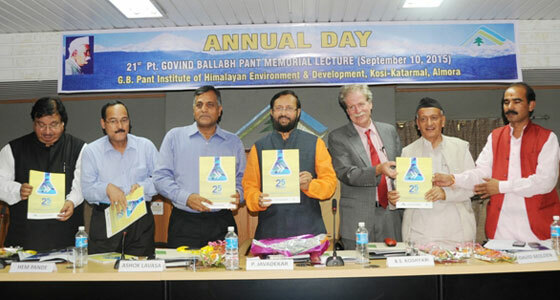 On 10 September, David Molden, director general of the International Centre for Integrated Mountain Development, was the first person outside India to deliver the keynote speech institute. This was truly a moment of reckoning for ICIMOD. Given in the back drop of memorial lecture of Pt GB Pant, who stood for truth (Satyagrahi), David drove home the point that science could help unveil truth about climate change. Using some amazing pictures & graphics, David rang the alarm bells, on account of both climate change and other changes happening in the Himalayas. David qualified science needs to relate to people and their problems (people’s science) and it must lead to actions — there must be a good connect of science with practice and policy to overcome challenges. Is it time to rewrite the quote, “Pahar ka Pani, Pahar lee Jawani; Pahar ke Kaam na Aani”? Translated it means, “both water and youth from mountain do not benefit mountains”. David used this often quoted saying in local dialect to some good effect, throwing the audience into bursts of laughter. But the hidden message was not lost either. How can the migration of youth from mountains be stopped and how can water be harnessed from so called “water towers” which could contribute to the prosperity of mountain people and its ecosystems? David drew upon a story from our taxi driver Mohan, who drove us to Almora. Hailing from mountains, Mohan was upset that youths like him had to leave mountains in search of unskilled/semi-skilled jobs, leaving behind their beautiful Himalayan homeland. Mohan was forthcoming to offer solutions as well. Only a massive focus on building new skills of mountain youths and promotion of natural resource-based enterprises he said could help them to stay back. Also reviving thousands of dying springs, would not only make great conservation sense, but would contribute to overall water availability for local people. David’s keynote was amplified by Hon’ble Minister who applauded David’s presentation for showing it was possible to take on the challenge of climate change by bringing science, practice and policy . The doomsayers must be shown their place, be it practice adopted by ICIMOD and its partners to bring home the message of hope, or the multitude of national programs and schemes undertaken to respond to challenge. Himalayan landscape provides space for actions that are driven by people and are informed by science. The message was clear, our response must befit the magnitude of this huge challenge, which is very much here and now. This will call for collaborative actions of multiple stakeholders, as well as a convergence of programs/missions with pilot actions. Massive awareness for actions will be required. The proposed Climate + Change mobile exhibition in the Indian Himalayan Region, over next two years, could become a rallying point for building an unprecedented collaborative network for awareness and actions. The music must live on. We must play music in the HKH mountains for the well-being of people and well-being of mountain ecosystems. May the music continue in HKH mountains and beyond for years to come.